I remember one of my early jobs when I worked for Honeywell as IT Director. We maintained those legacy Cobol applications, for Supply Chain, Finance, and Sales. Tailored made programs written to perfectly fit the Corporate way of working. Also, I remember when the ERP concept showed up. A standard information system that, although could be parameterized / customized to some extent, required your organization to adapt to it, changing the way the organization used to work. In those days that seemed to be a bit annoying, but after a while, most of the companies realized that this was a better way to improve company results and reduce costs, than having to maintain fully customized applications and non-standard systems. For robotics, end-users will be forced to do the same to some extent. The warehousing industry is one of those industries that is experiencing a major transformation towards the automation. Thanks to this, we could nowadays buy something between more than 400 million products in Amazon  and get it in almost a day at home. An automated storage and retrieval system (ASRS) consists of a variety of computer-controlled systems for automatically placing and retrieving loads from defined storage locations . Retrieval of items is accomplished by specifying the item type and quantity to be retrieved. The computer determines where in the storage area the item can be retrieved from and schedules the retrieval. It directs the proper automated storage and retrieval machine (SRM) to the location where the item is stored and directs the machine to deposit the item at a location where it is to be picked up. To store items, the pallet or tray is placed at an input station for the system, the information for inventory is entered into a computer terminal and the ASRS system moves the load to the storage area, determines a suitable location for the item, and stores the load. As items are stored into or retrieved from the racks, the computer updates its inventory accordingly . Companies like Daifuku or Logistex are offering these sort of systems. Sometimes among conveyors and lifts, there are also automated guided vehicles (AGV) as part of the ASRS system. A well-known example of this sort of robots is the case of Amazon, using Kiva robots for moving pods with items all around the warehouse. Other examples of AGV that are used in ASRS for moving cargo are autonomous forklifts (as those offered by Seegrid), able to move autonomously through the aisles with different navigation technologies, storing or retrieving pallets. Also interactive autonomous conveyors are used mainly in e-commerce industry, helping to locate and move products. Warehouse associates and robots work together to reduce travel time and maximize time-on-task. Workers work more, walk less. It makes for a better, happier work environment. Several companies offer this sort of solutions, like Locus Robotics or Fetch Robotics, with hmiShelf robot, which have a touchscreen (the human-machine interface, or hmi) to tell the robot when the load is complete and where to deliver the items. All these sorts of AGVs use different navigation technologies, generally based on magnetic or visual line following techniques, computer vision, Laser Range Finder and Sonar technologies, and other positioning and inertial systems. The key of this systems is that their Mean Time between failures (MTBF) should be very low, in an industry that requires sometimes 24/7 service. Stock-taking may be performed as an intensive annual end of fiscal year procedure (physical inventory) or may be done continuously by means of a cycle count. Cycle counts contrast with traditional physical inventory in that a full physical inventory may stop operation at a facility while all items are counted at one time. Cycle counts are less disruptive to daily operations, provide an ongoing measure of inventory accuracy and procedure execution, and can be tailored to focus on items with higher value, higher movement volume, or that are critical to business processes. Cycle counting should only be performed in facilities with a high degree of inventory accuracy (greater than 95%). The purpose of cycle counting is to verify the inventory accuracy and even though it is not an adequate procedure to be used to correct inventory errors, it is an adequate way to identify the root causes of inventory errors . There are several options to do an automated stock-taking with robots, both with AGV and Unmanned Aerial Vehicles (UAV) or more commonly named “Drones”. 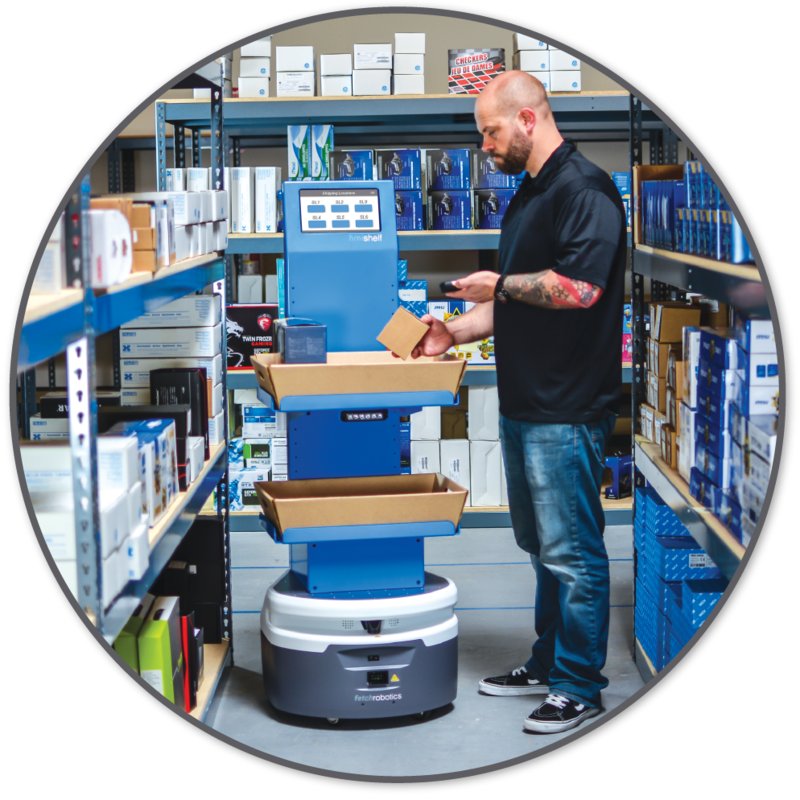 The advantage of an AGV is that it could work for many continuous hours with no need to recharge, but normally could only do stock-taking of items located at low heights. The robots could use different techniques for items identification. The two most common are RFID technologies and Barcode technologies. The first one allows very fast readings of several items even being inside boxes. A RFID reader could do all readings at some distance from the items. The Barcode scanning requires a precise location of the barcode tag and reading them, so items inside of a box could not be identified. Therefore, RFID technology is recommended in e-commerce warehousing and retailing, while barcode tags are more adequate for box and pallets, and is a cheaper technology, as is based on printed paper. There are several companies working on AGV/UGV robots for stock scanning, mainly for retail, like Simbe Robotics, 4D Retail Tech. Corp or Pal-Robotics with their Stockbot robot. In the case of big warehouses with cargo located at high racking levels, the stock taking is more complex. The traditional method requires people with scanners on Scissor Lifts moving through all the aisles, which requires time and prepared people. Using drones is an alternative to this way, either in a manual or in an autonomous way. The drone could embark the suitable sensors to read the tags (either RFID or Barcode) and send the information to the WMS for inventory update. About 95% of big warehouses use barcode tags as they are much cheaper that RFID tag, so here may be the big market. Infinium Robotics at Singapore, the company where I work for as CTO, offers a solution for stock-taking based on drones. It is an autonomous solution, able to fly within GPS-denied environments, do stock-taking, update WMS database and recharge batteries when needed flying to docking stations. The solution is called Infinium Scan. Wal-Mart announced in June that it plans to start using drones to handle stock-taking at one or more of its many warehouses starting next spring. A vice president with the firm said that a task of checking inventory levels that takes employees a month could be reduced down to a day by using drones. But although there are many companies offering or working on automated solutions for the warehousing industry, one of the key questions we have to understand is: ¿Will your solution offer the ROI (or payback period) expected by the customer? Not always is a reduction in manpower cost what management looks for. All these solutions make supply chain companies more competitive, improve their quality service and therefore help them to get more or better customers, keen to pay more for a better service.